Mozilla, the developers of the popular browser, Firefox, revealed today that it will be offering a Metro version of Firefox for Windows 8. The new Firefox for Metro, like all other Windows 8 Metro apps will focus on touch interaction and run full screen. 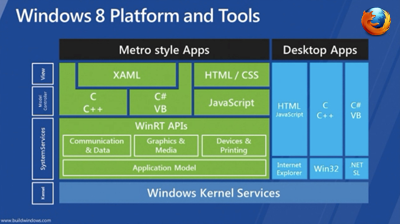 Moreover, it will be fully integrated with the Windows 8 Metro environment. It will have an Appbar that will include common navigation controls like back, reload, etc, the Awesomebar, and tabs too. It will support 3 snap states; full screen, 1/6th screen and 5/6th screen, depending on how the user docks two full screen apps. It will also offer a live tile with user-centric data like friends presence or other Firefox Home information updates. Firefox on Metro will bring all of the Gecko capabilities to this new environment and the assumption is that we’ll be able to run as a Medium integrity app so we can access all of the win32 Firefox Gecko libraries avoiding a port to the new WinRT API for the bulk of our code. (Though we will need to have a pan and zoom capability for content). We will need to determine if the Firefox front end on Metro will be built in XUL, C/C++, or HTML/CSS/JS, says Mozilla. Mozilla will simultaneously also release a version of Firefox that will run on the classic interface of Windows 8. I hope they have a beta ready for launch later this month, too. I’d like to try out more than just the included applications when the consumer preview is released.